Photos of Arts & Letters live featuring former Secretary of State Madeleine Albright. Images taken on Sunday, Feb 10, 2018. 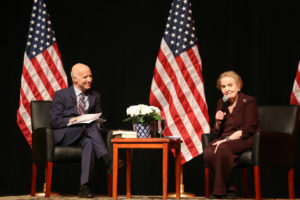 On Sunday, Feb. 11, the World Affairs Council of Dallas/Fort Worth welcomed 2,500 guests and the 64th Secretary of State Madeleine Albright to the McFarlin Auditorium on the SMU Campus. Albright discussed her latest New York Times #1 Bestseller Fascism: A Warning. Albright is the first female U.S. Secretary of State, serving in the Clinton administration from 1997-2001. Prior to her nomination, she served as U.S. Ambassador to the United Nations and was a member of the National Security Council. Albright has been a vocal critic of President Trump since his election. She is especially critical of his administration’s antipathy for multilateralism, particularly in regards to treaties, NATO and the UN. Despite these criticisms, she does not count Trump among other fascist leaders. “Trump is not a fascist, but he is certainly the least democratic president in modern U.S. history,” Albright said. However, Albright, an immigrant from then-Czechoslovakia, identified Trump’s scapegoating of immigrants as an element of fascism. She commented on the marked difference between the rhetoric of today and the post-WWII era. “When we went to the UK, they would say ‘I’m sorry your country has been taken over by a dictator. You are welcome here. How can we help you? When are you going home?’” Albright said. The event was presented in partnership with the Dallas Museum of Arts: Arts and Letters Live series and sponsored in part by Pegasus Bank. A book signing followed the program.